Chop anchovies, garlic, parmesan in the chopper attachment of a blender. Add mayonnaise, vinegar, lemon juice, Staffords Dijon Mustard, pepper, Worcester sauce, and oils and blend until smooth. Covered and refrigerated, the sauce will stay fresh for up to 1 week. Wash salad and pat dry. Slice the leaves diagonally (20 mm across). Put the leaves in a large bowl and add the dressing. Toss until the leaves are coated evenly. Serves 6. Cut Parmesan in cubes of 20 mm and grate. 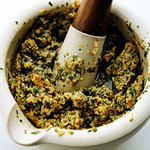 Put all ingredients for the dressing in a bowl and blend with a hand blender until smooth. Set aside in a jar with a lid. Preheat oven to 180ºC. Lightly brush the baguette slices with olive oil. Place on a baking sheet and bake until golden. Bring water, Staffords Balsamic Vinegar and salt to the boil in a frying pan, turn the heat down and add 2 eggs at a time. Poach eggs for about 4 minutes, according to taste. Set them aside on wet paper towel. Trim the lettuce. Cut into slices and place in a large bowl. 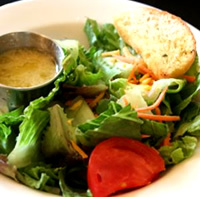 Pour the dressing and the grated Parmesan over the greens and toss gently. Serve on plates with the croutons and the poached egg on top. 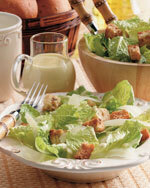 Instead of poached eggs, Caesar Salad can be served also with grilled chicken, fish or Italian prosciutto. Serves 6-8. 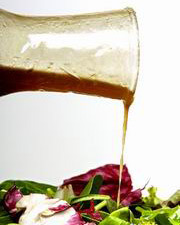 Combine the spring onion, vinegar and Staffords Dijon Mustard and gradually beat in the oil. Season to taste with salt and black pepper. Sprinkle the bread cubes with olive oil and grill with the bacon rolls until golden brown and crisp. Cool and mix with the remaining salad ingredients. 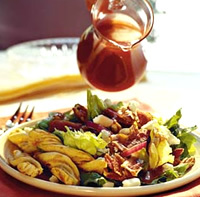 Pour the salad dressing over the salad, mix lightly and season. Serve immediately. Serves 4. Sauté chopped onions in butter until soft. Boil water and add salt. Remove from heat when boiling, add the couscous, stir and cover with lid, allow to stand for 10 minutes. 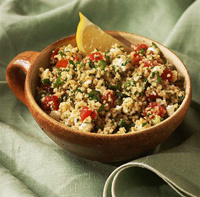 Add coriander, Staffords Capers in Vinegar, nuts, onions, lemon juice, salt and pepper to the couscous. Mix everything together and serve hot. Cut ciabatta into crouton shapes and toast in the oven with a drizzle of olive oil till brown. Cut tomatoes into wedges and discard the seeds, chop finely. Cut celery into four strips and chop coarsely. Cut cucumber into 20 mm thick slices. Cut the Staffords Mango Slices in Syrup into cubes. 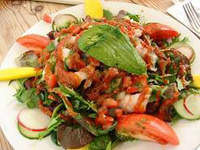 Combine onion with bread, basil, celery, tomato, mango and cucumber in large salad bowl. Combine red wine vinegar, Vesuvio olive oil and garlic together and shake well to form a light dressing to pour over the salad. Serves 4. Slice two mozzarella balls and place them on a serving platter. 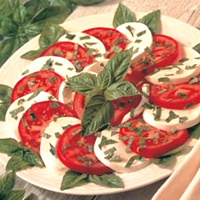 Top with tomatoes and scatter with fresh basil leaves. 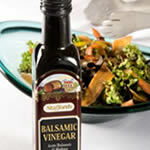 Pour Vesuvio Olive Oil and Staffords Balsamic Vinegar into a bottle with a lid and add the salt and freshly ground black pepper. Shake well to combine. Drizzle over the tomato salad and serve. Serves 4. Toss the bread with the garlic. Heat half of the oil in a frying pan and fry the bread until crisp and golden. Whisk the Staffords Cranberry Jelly, red wine vinegar and olive oil together until smooth. Carve the turkey and transfer to a salad bowl. Add the lettuce, dressing and croutons and toss well. 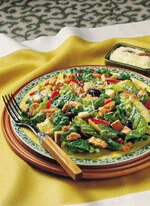 Scatter the grated Parmesan cheese over the salad and serve. Serves 4. In a small saucepan over medium heat, mix together the ketchup, Staffords Mint Jelly, honey, red wine vinegar, and butter. Bring to a boil, then remove from the heat, allow to cool, then serve. Serves 4. Mix together. Great with salad, meat and chicken. Blend all ingredients together until smooth. Taste, add seasoning if necessary.